Duke of Edinburgh’s Award – Adam Blyth and Kalvin Fraser have each been presented with their Bronze Duke of Edinburgh’s Award certificate and badge. Well done boys! FilmG – Anns an teirm a chaidh, bha sgoilearan ann an clasaichean Gàidhlig (S2, S3 agus S4) an sàs ann a bhith a’ sgrìobhadh, a’ fiolmadh agus a’ geàrradh fiolm airson na co-fharpais FilmG. Tha am fiolm a-nise deiseil agus e ri fhaicinn air làrach-lìn FilmG. ‘S e Leum nan Linn an t-ainm a tha air agus chithear e aig http://filmg.co.uk/en/films . Ma chòrdas e riut, ‘s dòcha gun bhot thu air a shon! Last term, pupils in the S2, S3 and S4 Gaidhlig classes were involved in scripting, acting and filming and editing a short film for the FilmG competition. This film has now been completed and entered on the FilmG website. Its title is Leum nan Linn and it can be viewed at http://filmg.co.uk/en/films If you enjoy the film, you may wish to vote for it! Malawi Visit report – Click here to read about the visit in December. 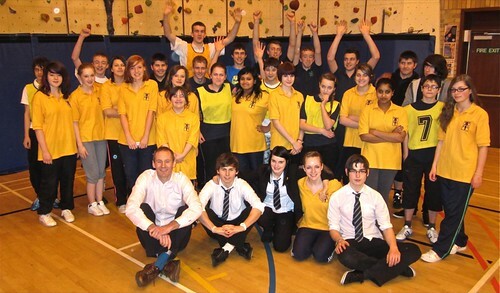 Basketball – We had games in Inverness on Saturday 21st January. Unfortunately only five of our boys turned up on the day. The efforts of Jordan, Matthew, Aiden, Alasdair and Gregor Vickerstaff (P7) became little short of heroic playing Culloden (the best U14 team in Scotland) and Inverness Bears “A”. We had no substitutes, so they were on for two full games without a break. Unsurprisingly, we lost both games. Our boys tended to be shorter than the other teams but we worked out they could grow 18 inches by always defending with their arms high in the air. Scores were 17 -50 to Culloden and 36 – 55 to Bears “A”. A very good showing, from the intrepid Gairloch boys. Very well done to them and to Mr. Johnston for taking them through on the day. 2012 GHS Calendar – A few copies of the school calendar (displaying pupil art work) is still available from the school office and local shops. Cost £5 and all proceeds go to school funds. Everyone in the community is invited to come along for what promises to be a really fun evening with Quizmaster Allan Gorman! There will be a variety of types of questions but the main aim of the evening is to have fun, as well as raising some extra money so that the pupils can engage in as many activities as possible whilst in France. Box Tops Collecting at the Library – Miss Hollenstein, our school librarian, is now collecting Nestle box top tokens to trade in for books. The scheme runs until 31st March 2012, so we are looking for a few dozen box tops to trade in for a nice School Non-fiction top up. It takes from 10 tokens to get one book, so the more tokens we collect the more books we can receive for our library. You can view the types of books that are available by visiting www.boxtops4books.co.uk. If your family eats Nestlé cereals, please remember to tear off the token on the top of the box and hand it into the library. We hope everyone had a good Christmas and are looking forward to a productive and healthy 2012. School resumed last Monday and, as always, we expect the coming weeks to be busy. In addition to the normal classes there will also be additional activities including after-school study club in the run up to the S5/6 prelims which begin at the end of this month. We will be attempting to keep the after-school clubs and activities going in spite of the budget cut resulting in the discontinuation of the late bus at 5pm to Aultbea on Tuesday, Wednesday and Thursday. This week and next we are grateful to Allan Jones for his assistance and we are hopeful that with the support of other volunteer drivers and parents that opportunities for the pupils will not be curtailed. A Christmas Carol – We hope that everyone who attended our production of ‘A Christmas Carol’ by Charles Dickens enjoyed the experience. Well done to the S2 pupils who worked hard throughout the term to prepare for the two evenings of the show in December. They did a great job and rose to the challenge admirably. Thanks to Miss Hunter, Ms Mackison and Ms Gulliver for working with the pupils throughout and also to Hayley Savage from Eden Court Theatre for her valuable contribution. 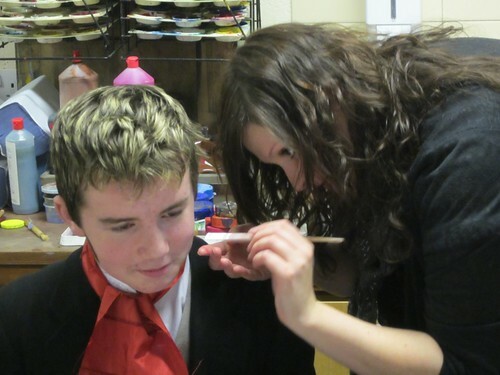 Many other staff also assisted both before and during the performances to ensure the whole event was a success for the pupils. Click on the photo below to see many more images! School Dance – Immediately after two evenings of Dickens’ we assembled again for the Christmas Dance. It was a great success with music, food and dancing right up to the end at 11pm. 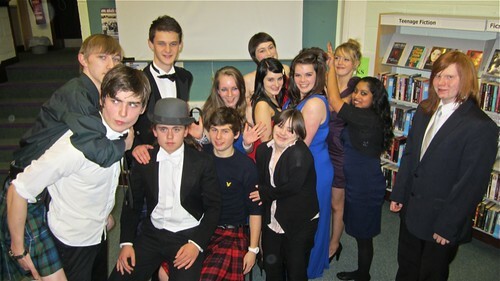 Thanks to everyone who makes this fabulous occasion possible – the list is long but the pupils appreciate it. Office staff in the school that sell tickets and manage the finance. Mrs. Fraser and Mrs. Mackenzie, along with others too numerous to mention, who purchase and prepare the half-time banquet. On the night this group of ladies spend the first half of the evening in the school preparing the food while the pupils dance to the music. This year music was provided by Roya Maclean and her Ceilidh Band. The three musicians were great while Campbell Elder gave a creditable performance as Master of Ceremonies! Prior to the dance the PE staff work hard in school teaching and reinforcing the dance skills required to allow S1 to S6 pupils to participate comfortably with reels, waltzes and Boston Two Steps. Our piping tutor, Mr. Andrew Shilliday supported four senior pipers (and a drummer) who provided a rousing start to the evening as is traditional at our dance. We also rely greatly and are appreciative of the support of the local garage for transport to and from the dance along with additional minibus driving this year from Mr. Bowker. Click on the photo below to see lots more images from the dance. Finally it is worth mentioning that it is the pupils’ participation and enthusiasm that make this such an event and worthy of the effort put in by so many. 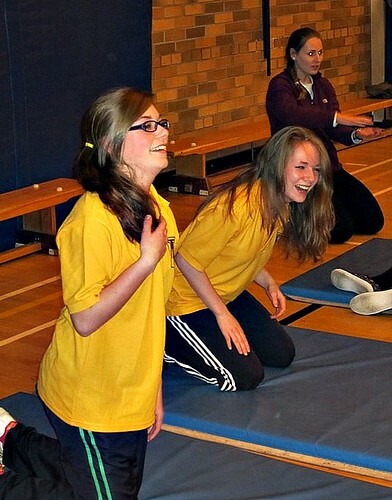 Krypton Factor, Indoor Rowing & School Quiz – We like to end the term with a variety of activities that are important educationally and encourage a sense of community and challenge. Thanks to Mr. Hulme and Dr Caley the school quiz provided the challenge with questions that even some of the teachers couldn’t answer! All the pupils are mixed into House Teams and they compete for House points. The pupils also took part in an Inter-House indoor rowing competition Thanks to Mrs. Johnston and her S4 Skills for Work pupils who organised the event, more House points could be gained either as part of a team event or by taking part in an individual rowing challenge. Click on the photo below to see many more images! Finally Mr. Johnston with help form many staff organized a Krypton Factor Challenge. Pupils, again in House Teams, took part in Mental Arithmetic, Mental Agility, Observation and Listening, Strength, Endurance & Sports’ Skills. All had good fun and we hope that pupils get to know each other a little better by taking part in events that are a bit different from the norm. Click on the photo below to see many more images! Music Success – Well done to Ruairdhri Wright who has passed his Grade 5 Piano. Ruairdhri was presented his certificate at assembly just before Christmas. WELDTECH Cycle Maintenance – Andy Bowker attended a course at Glenmore Lodge before the Christmas Break and achieved a Gold Award. This will allow us to further develop pupil skills in bike maintenance. Well-done Andy! Duke of Edinburgh’s Award – Jake Bulmer has achieved his Silver Award and not Bronze as stated incorrectly in the last issue. Apologies and well done to Jake who is now planning to work on achieving Gold. This error has been corrected on the website. Car Wash and Cake Competition Fund Raisers – A big thank you from Nick, Euan and Sandy in S5 to all who supported us in our Event Organisation car wash on Saturday 10th December by turning up to have their cars washed and who gave generously for the privilege! We took £110 which is a big boost to our funds for the main event, an educational visit to Edinburgh Castle Museum, which we now have to finish organising. An especially BIG thank you must go to Andy Bowker who helped with equipment and came in to unlock and lock up the school; to Sandy Campbell who very kindly came down to set up and pack away the fire service hose, (now we know why fire people need big muscles…); to Mrs. Stein for getting Nick to Gairloch through the worst snow she cares to remember and for providing us with lunch to keep us warm and cheerful. Thanks also to Murdo MacLean for putting us in contact with Sandy. Ms Newman said – once again, it was wonderful to witness the generosity and support of the community for the school, our activities and our pupils. Nick and Euan also organised a ‘Guess the Weight of the Cake’ competition at the school and at the ‘Fair in the Square’ on the Square on 21st December. The cake, made by Nick and his mum, weighed in at 1905g and was won by Mrs. Bulmer with an excellent guess of 1900g. We raised £34 for the same cause. 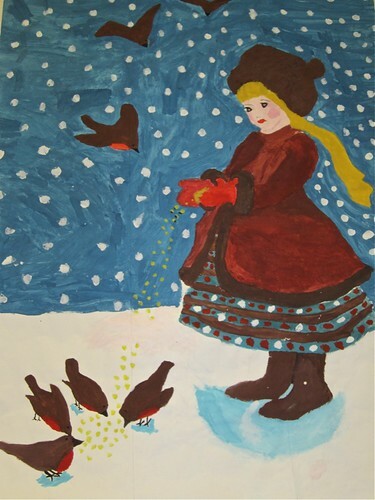 One of the Christmas posters produced by pupils under the guidance of Ms Gulliver. These large format poster hang in the Hall. Click on the photo to see more.